In between trying to get some work done around the house, we had a side trip to Lowes, so on the way back we tried some local Indian takeout. Generous serves of chicken tikka masala, Baingan Bharta, garlic naan and rice with peas (peas pull0). With tax the total was $26.12, but we only finished the naan ($3.26) over two serves. The rest made up four serves for $5.71 a serve. Add half the naan to each serve, and lunch today cost $7.34 a serve. It’s a generous recipe making at least six serves. For the protein we used ground pork from our monthly Prather Ranch delivery. Greg also uses half chicken stock and half ‘half-n-half’ instead of the more dairy focused version in the recipe. Add 10c per serve for herbs and seasonings. Tonight’s dinner cost $3.70 per serve. It’s an excellent soup and well worth the effort. Served with an interesting green salad that featured shaved fennel, it was pretty tasty. At $18.06 a serve it wasn’t cheap, but then it is in Santa Monica. After a long day in Santa Monica and fighting traffic, there wasn’t the will to cook from scratch, so Greg took some partially prepared items from Trader Joe’s and made a meal of them: Pork belly steamed and fried off with ready cooked lentils that were reheated in chicken stock with onion and celery added to enhance the flavor. 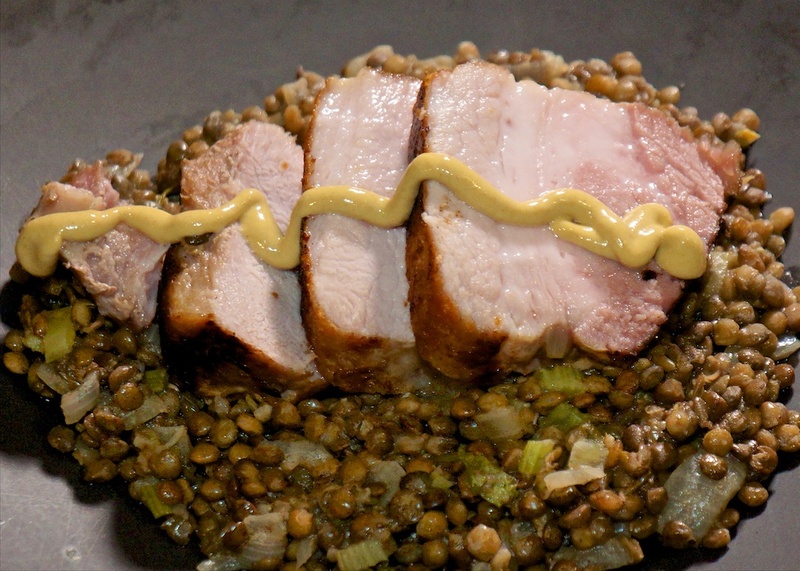 The pork belly was steamed on top of the lentils while they were cooking, then fried off to get some crispness and mayard reaction on the surface. The onion and celery add another 14c per serve. Tonight’s quick, but very tasty meal, cost $4.14 per serve. Because we were in Burbank returning the keys to our apartment and because we had to go to Ikea anyway, we had the meatball lunch including some pretty good soups: Turkey Gumbo and Split pea and kale. The combo meal is $7.61 including tax per serve. It’s Alpha Dogs’ Editor’s Lounge night tonight and at least one of us eats free! The other cooked some pasta with a basil pesto, for under $1.75. For lunch we reheated a Trader Joes Steak and Ale pie. It’s more of a British style meat pie, than an Australian one, but not bad anyway. Today’s lunch cost $5.99 a serve. Dinner tonight was complicated by one Foodie collecting someone from the airport while the other stayed at home a little under the weather. Ultimately we shared a Cobb Salad for about $7 a serve with tax. For lunch today we finished off the Red Beans from a couple of nights ago. No rice or bread. Lunch today cost $1.03 per serve. It’s LACPUG night and that means pizza at Palermo’s afterward. Great company and great pizza. Tonights meal was $5 a head contribution. Time to finish off the Salmon Chowder from the weekend. Without bread the salmon chowder cost us $1.92 a serve. 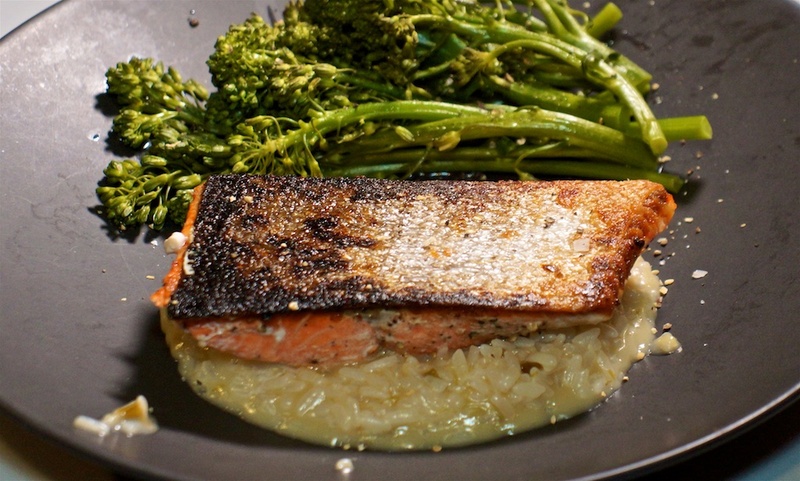 Wild caught Salmon cooked with crispy skin accompanied by a lemon risotto done in the pressure cooker with steamed brocollini. To cook the salmon, heat a oven proof pan on the stove top with a little coconut oil (best for high temperature cooking because olive oil breaks down at high temperature). When hot, the salmon goes in skin side down for two minutes, before the pan goes into a preheated oven to finish the cooking. Do not turn the salmon or the skin will lose its crispness. The pressure cooker is a great way to cook risotto because it doesn’t require the constant attention risotto otherwise requires. The wild caught salmon was $10.01 or $5.00 a serve. The lemon came free from a friend. Dinner tonight cost $6.75 a serve. The foodies were in different places during lunch, and Philip had to get take-out as he was back Burbank during lunch. In and Out double-double animal style. The semiSerious Foodies finally had our kitchen range installed today, and an electric convection oven is great for reheating fried chicken. Dinner tonight cost us $3.98 per serve. Because we were still moving some of our belongings from Burbank to Twin Lakes, we took the opportunity for a (possibly) last time getting Popeyes Fried Chicken – at least from the Burbank location. Eight pieces of chicken were $9.99, but that makes four serves in all, making each serve $2.50. 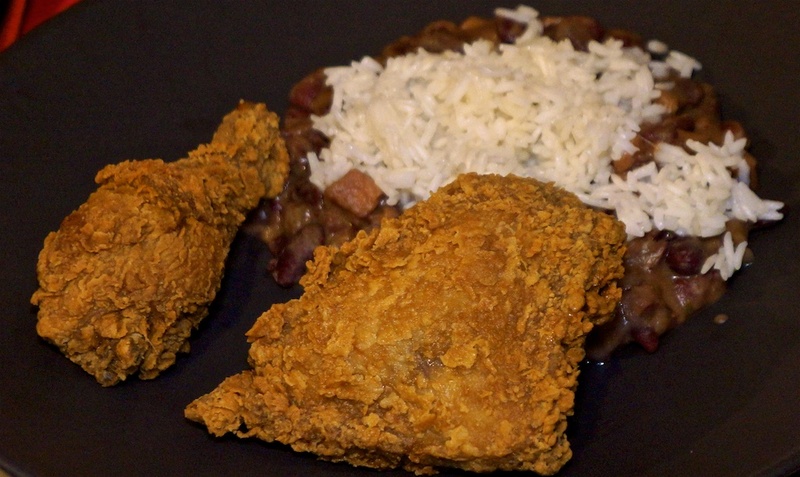 The large Red beans and rice was $3.99 and we shared that for $2 a serve. In total, lunch was $4.50 a serve. Still no range, so we reheated the Salmon Chowder and had some more of the Roast Garlic Bread. As it did yesterday the salmon chowder cost us $1.92 a serve. 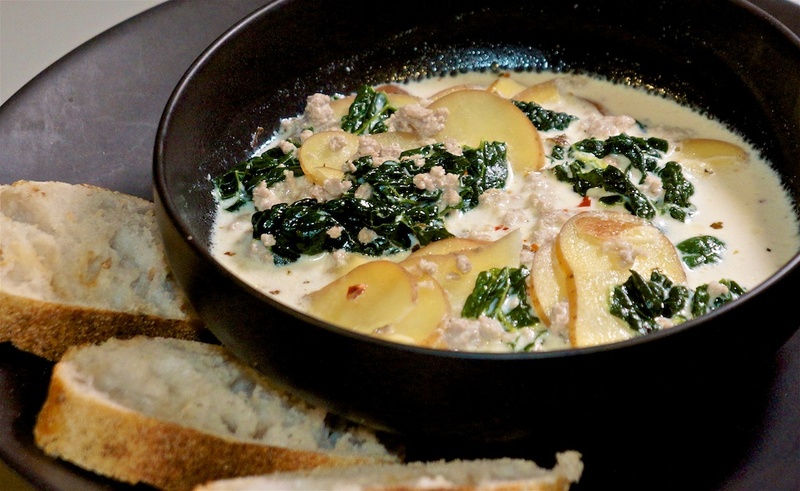 Served with Roast Garlic Bread the total for this quick and easy meal is $3.72. Because it was our primary moving day, we grabbed a burger from The Munch Box in our new neighborhood. That’s the first burger we’ve had with chili on it, but it was pretty good. At $3.40 a serve the Hickory Burger is pretty good value. While this was the first night living in our new home, a snafu late in the week left us with no range until Monday. 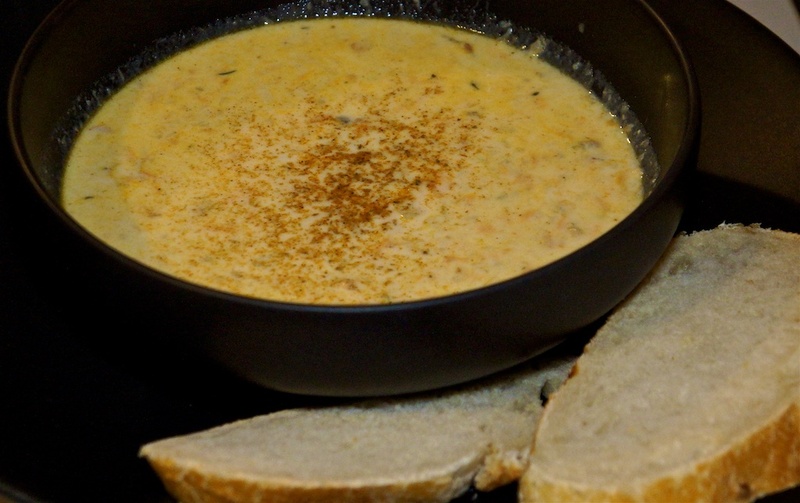 Fortunately we have an induction cooker with two hobs, so Greg cooked a favorite: Salmon Chowder. 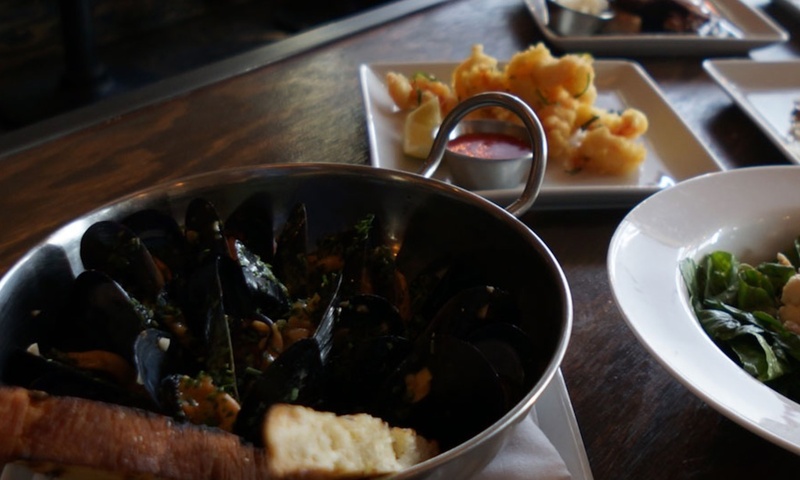 This is a recipe that Greg created, but it’s a pretty basic seafood stew. It’s big advantage is that everything is available from a supermarket. The recipe makes six serves. The salmon chowder cost us $1.92 a serve. Served with Roast Garlic Bread (already baked as we have no functioning over or grill) which was $4.49 for the loaf: we ate around 40% of the loaf for this meal of $1.80. The total for this quick and easy meal is $3.72. Since we were nearby, and because today and tomorrow are our primary moving days, the simplicity of supermarket sushi won out. Today’s sushi cost $12.78 or $6.39 a serve. While I normally argue that dinner out is more about the occasion rather than the food, Commonwealth Restaurant is a place to go for the food! It’s a pity we waited until the night before we moved out of Burbank where it was a short walk away, to a 22 mile drive away! The food was exceptionally good. Each one of the small plates were exceptional. The sequencing was perfect. From the Grilled Eggplant and Burrata to the Seared Hanger Steak and Truffle Mushroom Risotto every plate was perfect. Our waiter offered to sequence, and again the call was perfect. The Grilled Eggplant was followed by the near perfect Pork Belly, followed by the Hudson Valley Duck Confit. There was a pause before we finished the meal with the steak and risotto. The level of attention was perfect. In fact it was a rare night out where every element was simply perfect. OK it wasn’t cheap at $47 a serve, but it was well worth it. In context, that’s about half what we’ve spent per serve for the month so far. Did I mention it was worth it? I took a screen snap of the image from the Commonwealth’s website.